Retro Eames, Herman Miller, Knoll, McCobb, Bertoia Lamps. Vintage ARTELUCE Sarfatti Double Mid Century Modern Floor Lamp Lightolier Style! This is a very unusual vintage mid-century combination floor and reading lamp. It features a larger pierced cone torchiere shade lamp for room lighting and the weighted swing arm lamp for personal task lighting. Impressed mark in the iron weigh in the base along with C5220. 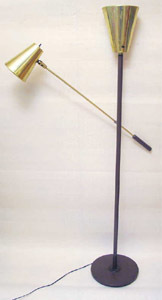 (see picture below), Gino Sarfatti for Arteluce or Lightolier? It is 61" from the floor to the top of the stationary large cone top. 35" overall length on the arm. Nice long, 114" good original cord and plug. On/Off switch on each cone. Brown metal base, center pole and arm weight. Brass finish on the exterior of the cones and on the swing arm. Interior of shades is white. Stationary center lamp is set up for 3-way. Smaller cone is articulated and moves in and out and from side to side. The lamp is in good working condition. It displays fine for use but does need some restoration to be a real eye catcher again. There is some toning to the brass finish, some rubs and wear, a dent on the edge (switch end) of the smaller shade. Some rubs, scuffs and scratches to the sides of the shades. The finish on the base has rough spots and wear. Its a good quality made lamp in a hard to find design that would be a prime candidate for personalized restoration to fit into your mid-century modern decor. This stunning vintage bronze table lamp was produced by the talented artists and craftsmen from the Marbro Co. back in the late 1940's. To understand and appreciate its unique and distinctive style, one has to look to it origins. Lamps produced by Marbro were not just run of the mill lamps that you could find in chain run furniture, or discount stores. Almost all of their lamps were built to order for renown designers, high end retailers, movie stars and other rich and famous celebrities. Even presidents were customers of Marbro! Lamps would began with a piece of art from world wide artisans. Some pieces were antique others were more period. 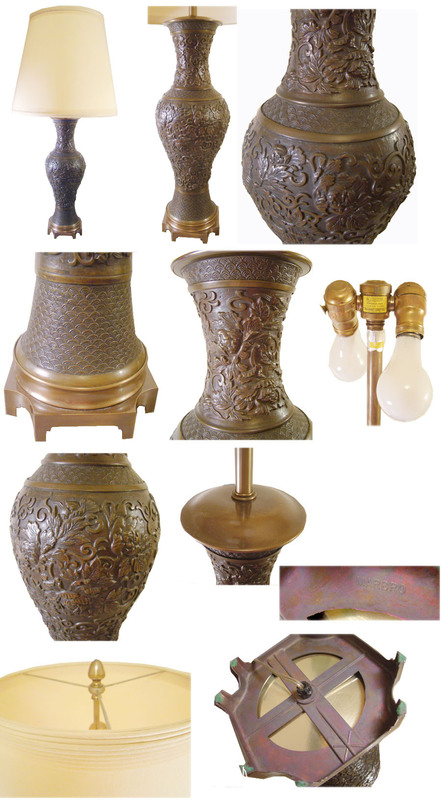 In the case of this lamp, it began with a finely detailed bronze vase form from Europe. In the hands of the Marbro craftsmen it took on its distinctive style, with the finished arched base and brass post, top cap, double light socket. Yes it is one of a kind and the fact that original bronze vase was hand made, ensures that no two vases were identical. This lamp is complete, and all original and in excellent vintage condition.. It retains its "Old World Craftsmanship, New World Style Marbro, foil label, although the label is faded and tattered on the edges. It also has the Marbro embossed mark on the bottom of the base. It is majestic with its 41" overall height. 23" tall from the base to the top of the bronze body. Quite substantial weighing in at 16 lbs. It is in good working condition and looks fabulous. No breaks or cracks or repairs. Original pattina. Shade shown is not included and was only shown to give an idea of the overall display beauty of the lamp. A beautiful unique and high quality lamp to add to your decor. Bronze lamps by Marbro are a very illusive, and finding this one has been a real treasure for me. Today their lamps are highly collectible and sought after by anyone who are familiar with the company's history. Another interesting note, bronze and crystal lamps were the top of the line for Marbro, and sold for $2000. to $4000.00 originally! MID CENTURY MODERN TRIPLE TABLE LAMP! Unusual vintage mid-century modern table lamp. Three square brass tubes rise up off of the round weighted brass base. Each is curved at the top with a suspended lamp. Each arm has a unique glass "wave shade". Each has a flowing form with lobes. They are frosted glass that has white wavy lines overall. There is no markings or labels. Green felt on the base. Good long original cord. Button switch on the base. Lights 1-2 or 3 of the bulbs. Lamp is in good working condition. Looks great although the patina of the brass has spotted and darkening. The glass shades are in very nice condition with no damage. It stands 34" tall overall and the base is 10" across. A perfect fit in any mid-century, retro modern decor! 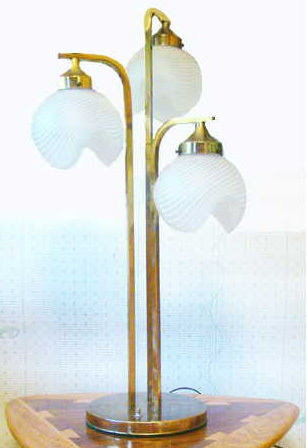 FABULOUS PAIR OF PAUL MCCOBB DESIGNED LAMPS FOR CALVIN, 1950'S HOURGLASS LAMPS. Nice original condition. Add some shades of your choice and your ready to go. Finish on the wood is nice and the brass still shines. There is some toning to the metal caps. Still look great overall. Lamps are unsigned but are attributed to Paul McCobb and date to the 1950's . 22" tall on the base. 5-1/2" across the base bottom. 30" tall overall. Shades shown are not included.